The Light Horse of the City of Philadelphia, or "Philadelphia Light Horse", was established in 1774. It was a volunteer militia unit, formed by "a group of prosperous gentlemen" (according to Uniformology's book on the Continental Light Dragoons). The troopers bought their own equipment and provided their own horses. The coat was "rust brown" faced white, while the cap was of black leather with a buck/fox tail crest. Apparently the unit's flag was presented by the first captain of the troop, Abraham Markoe, who had previously served in the army of Denmark. However, King Christian II then issued an edict banning Danish citizens from fighting in foreign wars, and so Markoe had to be replaced. During the AWI the troop oftern acted at Washington's personal bodyguard and messenger service. The unit was present at the battles of Trenton, Princeton, Brandywine and Germantown. Being essentially a militia unit it was never formally disbanded at the end of the war and survives today as Troop A, 1st Squadron, 104th Cavalry Regiment, 28th Infantry Division, Pennsylvania National Guard. It is, apparently, the oldest military unit of US that is still in service. The Philadelphia Light horse don't appear in any of the published "British Grenadier!" scenarios, but I've wanted to paint up this unit for years, largely because I love the brown coats with their white facings and the bucktails and light blue turbans on the helmets. I can always use them to add numbers in those 1:5 ratio scenarios where a lot of cavalry are required on both sides. I had some Foundry Continental Dragoon figures left over and was originally intending to paint just one stand of 2 figures. But I then realised that I'd bought the unit's flag (from Adolfo Ramos), so I had to pick up a command pack from Foundry at Salute this year. The means I still have 2 Foundry figures left over that I'll need to find a use for. The coats were painted with Foundry's "Bay Brown 42" palette. Sources refer to rather fancy brown shabraques with embroidery and white silk finishes. I decided against painted those on the horses and instead used my normal blue-grey colours to suggest more work-a-day furniture. 4 figures. Painted April-May 2017. Flag by Adolfo Ramos. This is the infantry element of Pulaski's Legion (the mounted troops being here). In the "British Grenadier!" scenarios it appears as a unit of 6 skirmishers at Savannah. So far as I can tell, the only way to model this unit in 25mm without doing your own conversion work is to use KMM figures as they provide heads specifically for the Legion (KMM-08). This then gives you a choice for modelling the Legion infantry - you can use the generic Continental infantry figures or the newer dismounted dragoons. I chose the latter as KMM's proprietor, Bill Nevins, had sent me several packs of these figures and I was keen to try them out. The Continental infantry figures are probably more appropriate for the specific Legion infantry (as opposed to Legion cavalry who have dismounted to skirmish), but given that only 6 figures are required I don't really think it matters. But if you want to make up a unit of Pulaski's Legion infantry, then the figures in overalls and packs would be perfect. I have 7 figures here because I wanted to add the officer as well (there's also an eigth figure in the range which isn't present in the unit - a standing loading figure). The rank and file figures are based in threes as second-grade skirmishers under the "British Grenadier!" rules. I suppose I could add three more figures and use this unit as the dismounted version of the cavalry, given that charging the fortifications at Savannah isn't really something any sane gamer is going to try (historically that didn't work out well for Pulaski). Like the mounted troops, I painted these figures about a year ago. I did take photos at the time but I wasn't really satisfied with them and decided to wait until the rest of the Legion was finished before having another go. To the right is a picture of the entire Legion, with Pulaski at its head. As I've said, these troops only feature in the Savannah scenario (although the Legion, or parts thereof, were engaged in skirmishes at other times), which is the orbat I have half an eye on at the moment. I'm currently working on more cavalry for both sides and I've also just added a couple of figures to my 3rd Continental Dragoons, to bring them up to strength for the Indian Field scenario - you can see those here. 7 figures. Painted April 2016. Casimir Pulaski was born in in Poland in 1745 and began soldiering at an early age. In 1777 he met Benjamin Franklin and Lafayette in Paris, who then introduced him to General Washington. Pulaski seems to have started off with some sort of staff or advisory role but was then made a brigadier general and given command of all American cavalry. He spent the winter of 1777-8 training and outfitting the cavalry units but in March he resigned his command and suggested to Washington that he form an independent legion of cavalry and light infantry. This idea was approved by Congress in March 1778 (see below) and Pulaski's Legion was born. Many of the recruits were German deserters and British PoWs, officered by Polish and French expatriates (apparently thirteen Polish officers served under Pulaski in the legion). In October 1778 the Legion and some other troops were attacked at what became known as the "Little Egg Harbor Massacre" and lost 30 men. In February 1779 the Legion was sent to the south and Pulaski was instrumental is lifting the siege of Charleston. The Americans then moved onto their own siege of Savannah. By this time French forces had arrived and on 9 October 1779 the allies made their disasterous attack on the town. Seeing the French infantry falter, Pulaski galloped forward with his legion to rally the men but was mortally wounded by cannon shot. He died two days later, on 15 October 1779. His Legion was disbanded the following year and the men transferred to Armand's Legion. The published "British Grenadier!" scenarios only feature Pulaski's Legion once - 10 figures at Savannah. I painted Pulaski himself back in 2011, using a Eureka Miniatures "Baron Munchausen" figure. 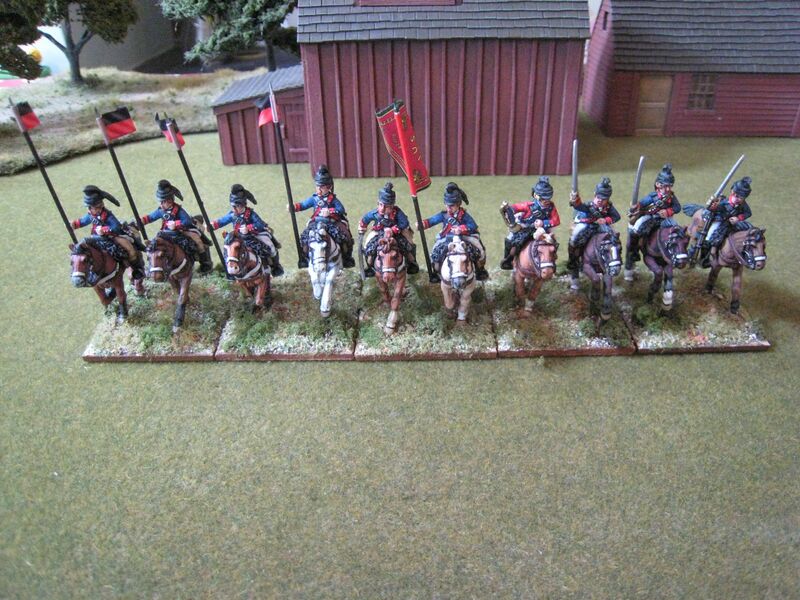 For his Legion I've used the Eureka "ragged Continental" cavalry figures, wearing brass helmets. I painted all the figures and horses last year, having picked up some reinforcements from Eureka at Salute 2016. However, for whatever reason the figures came with the wrong helmets. I knew that Eureka would have replaced them without any fuss, but I failed to let Eureka know and then eventually this year's Salute was just around the corner. I'd been mulling over what figures to use for Loyalist South Carolina cavalry, so I thought I'd just order some more figures and re-order the correct helmets. So I spent last week painted all the helmets and finishing off the basing, even though the figures themselves were painted almost a year ago! Pulaski seems to have recruited more men than Congress ordered, as the muster rolls of August 1778 refer to "three companies of horse, armed with lances, and three companies of infantry, a total of three hundred and thirty." So how many troopers were actually armed with lances and for how long? Who knows - but the justification for having lancers is there in the archives. So I decided to give lances to 4 of the rank-and-file figures (which of course meant using the same standard bearer figure 5 times). The pennants are from Adolfo Ramos - I don't know how authentic they are, but the lances would look a bit bare without them. My first choice was white over red, but I realised I'd used most of them up on my BAL dragoons, so had to use black over red instead (the only other option was yellow over light blue!). I think they look ok. The legion's flag is well-known and has a complicated design, Despite there being plenty of information on this flag, no one seems to make it in 25mm but it was pretty easy to download a couple of pictures and make my own (I wasn't going to try to paint it myself from scratch). It reads "Unita virtus forcior" [sic], which is supposed to mean "union makes valor stronger"; and then, on the other side, "Non alius regit", which means "no other governs". Apparently the flag was rescued from the Savannah battlefield by a wounded lieutenant and now resides with the Maryland Historical Society in Baltimore. 10 figures. Painted March-May 2016.